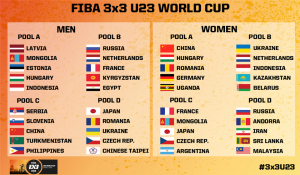 XI’AN (FIBA 3×3 U23 World Cup 2018) – The 40 participating teams (20 men’s and 20 women’s) were divided into 8 pools of 5 after the automatic seeding of the inaugural edition of the FIBA 3×3 U23 World Cup that will bring together the best 3×3 U23 teams in the world in Xi’An, China, on October 3-7., 2018. Hosts China will not have an easy path to the next round in the women’s category as they will have to play 2017 3×3 U23 Nations League winners Hungary and the event’s MVP Vivi Böröndy. Germany also bring back 3 out of the 4 players who were at the World Cup in The Philippines in June. Romania and Uganda complete Pool A. The recent FIBA 3×3 U23 Nations League winners France will have a tough start in the competition, especially in the men’s category, where they will play their archrivals from Russia and The Netherlands. Good luck to Kyrgyzstan and Egypt in Pool B. Things were easier for the women, placed in Pool C as they were seeded with Mongolia, Japan, Czech Republic – featuring 2016 3×3 World Champ Sara Krumpholcova – and Argentina. Hosts China were placed in the most difficult pool of the men’s category (Pool C) with Serbia and Slovenia, who bring back two players who finished undefeated last year at the U23 Nations League. Not to mention Turkmenistan and The Philippines, which will star Ricci Rivero, who made his 3×3 debut at the FIBA 3×3 U18 World Cup back in 2015. Can 2017 U18 Asia Cup MVP Haonan Li guide China to the quarter-finals? Pool A will see Latvia, Mongolia, Estonia, Hungary and Indonesia compete for two places in the next round. While Japan, Ukraine, Czech Republic, Chinese Taipei and Romania, featuring Victor Bogdan, were placed in Pool D.
Indonesia and Kazakhstan will have European company in Pool B with Ukraine, 3×3 powerhouse Netherlands and Belarus, who won silver at the FIBA 3×3 U18 Europe Cup in 2015. Last, but not least, Russia headline an open Pool D with Andorra, Iran, Sri Lanka and Malaysia.